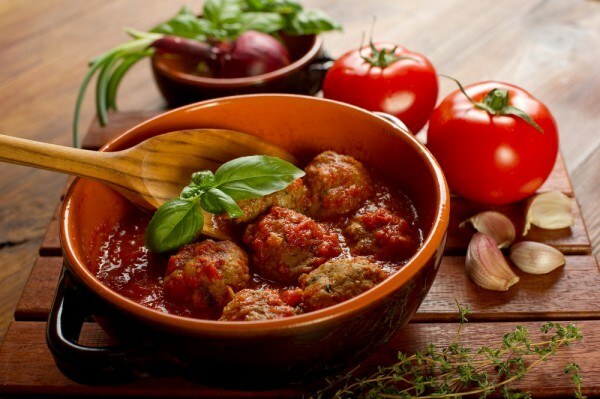 Meatballs are called meat dish from boiled or fried balls of meat. Cook meatballs of beef, pork, lamb, chicken, Turkey, rabbit and fish. To the table they are served, usually with some sauce that makes the dish juicier and tastier. - 1 tbsp of flour. Prunes wash and pour for 15 minutes with hot water. When it swells, drain in a colander, drain and finely chop the prunes. Carrots and onions clean, wash and chop: grate carrots on a coarse grater, and onion cut into small pieces. Then fry the prepared vegetables in vegetable oil. Add chopped prunes, tomato paste, Bay leaf, salt, sugar, black and fragrant pepper. All mix well and pour a dry white wine. Sauté the sauce for 10-15 minutes and remove from heat. Then the meatballs are ready, put in refractory form and pour the prepared sweet and sour sauce. Put in preheated oven and bake for 20-25 minutes. Heat in a water bath butter. Flour fry in a dry well heated pan and, stirring constantly to avoid lumps, pour the hot meat broth. Then mix with melted butter and boil on a water bath until thick. Then set aside 3 tablespoons in a separate bowl and refrigerate. Separate the yolks from the whites and whisk the egg yolks with freshly squeezed lemon juice and 3 tablespoons of the cooled sauce. Connect the resulting mixture with the bulk of the sauce, season with salt and pepper, stir and heat for 3 minutes in a water bath, stirring constantly. Remove the finished sauce from the heat, add the finely chopped parsley and mix well. Before serving meatballs to the table, pour them with lemon sauce. Flour sauté in butter until brownish color. Then add the sour cream and boil everything on low heat for 5-10 minutes, stirring constantly. At the end add salt to taste and pepper, stir, remove sauce from heat and strain. Then again put on fire and bring to a boil but do not boil. Pour prepared cream sauce meatballs and serve. Melt in the pan butter. Mushrooms clean, cut into slices and fry for 5 minutes in melted butter. Then add wheat flour and fry together with mushrooms. Then pour in the tomato juice, strong beef broth and wine. Mix everything well and cook the sauce on low heat for 15 minutes, stirring occasionally. Mushroom sauce is ready remove from heat and pour evenly over meatballs. Meatballs, usually made the size of a walnut. Meatballs you can serve with boiled rice or pasta and mashed potatoes.